Note: There were so many actors who made it on versions of my top 5 favorite actors that I could hardly leave mentioning any of them. But this was a great year for lead actors, who always get the best roles in Korean dramas. Ask me again another day and I might change the order and the people in my top 5. But today, these are my five favorites this year. Ji Hyun Woo is intelligent, kind, special, and just plain adorable in Queen In Hyun’s Man. Kim Myung Min delivers a typically splendid performance as a perfectionist and narcissistic drama producer in The King of Dramas. Lee Jun Ki is one half of the most adorable couple on TV this past year with his intelligent and totally loveable magistrate in Arang and the Magistrate. Gong Yoo’s heartbreaking and hilarious performance is the best and possibly only good thing about Big. Kim Soo Hyun delivers a deeply felt and moving take on a King hung up on his first love in The Moon that Embraces the Sun. Sung Joon is naturalistic but super charismatic as the lead singer in Shut Up! Flower Boy Band. The King 2 Hearts is an interesting drama because it has so many genres built in it. The most potent, however, is a bildungsroman as we follow Lee Jae Ha’s tremendous growth from a spoiled brat to a world-class leader. The only reason that Jae Ha feels different from all the other man-child characters we’ve encountered in other dramas is the depth that Lee Seung Gi imbues in his portrayal. Of Lee Seung Gi’s three drama roles, this is his absolute best, combining the easy charm and charismatic draw in “My Girlfriend is a Guminho” with his conflicted inner turmoil in “Shining Inheritance” without the stilted mugging that he sometimes offered. Lee provides a beautifully multi-dimensional character for us to watch and as the stakes get raised, we watch him unravel beautifully onscreen as he face every challenge with deeply felt fear and uncertainty. The political scenes might bore anyone uninterested in such mess but Lee is always captivating. His best scenes are always while playing a mental chess game with Kim Bong Goo—always confident but you can see the tiny cracks of fear and low self-esteem seeping in through. By the end of this drama, Jae Ha is such a completely different character from where he began that it is through Lee’s miraculous handling and consistently amazing performance that we can see how he ended up where he is now. Best scene: Mom and Hang Ah get kidnapped and he gets crippled with self-doubt and finally some honesty about who he thinks he is. So sad. If there is one question I’d like to ask Lee Bum Soo, it’s this: is it hard being the best damn thing about all the show he has been on? How does he do it? Yoo Bang is such a pathetic character at the beginning but never once did he come across as such because Lee Bum Soo provides such an easy charm and such a humorous approach to his character’s sad life that I feel okay with laughing at his misfortunes. Even more amazing is the lack of condescension in his performance. But more than that, Yoo Bang seems so at ease and okay with his lot in life, jumping from one job to another. Of course as things get better for his character because of the miracle drug, Lee’s performance takes off spectacularly. Who can resist his funny shticks or how he has a magnetic rapport with all the other cast members. Moreover, he imbues a sense of principled dignity in Yoo Bang that even though we know it’s the miracle drug doing the smart-talking, plan-scheming, we can’t help but feel like Yoo Bang actually had the potential to have developed all those skills that are attributed to the miracle drug. It’s all thanks to Lee Bum Soo who truly has a Midas touch for turning everything into gold. Best scene: There are too many scenes to think about but probably my favorite was the whole Versailles Yoo bit. Spectacular because you can see he actually enjoys those things but at the same time it’s a ploy. The premise of Nice Guy seems totally bonkers considering how crazy everyone in this show is. I love a show that is unafraid to make its characters so unlikeable but only to a certain extent. So it’s a great treat to have Song Joong Ki start all the way from the bottom of irredeemable hell all the way to the top as he makes amends for his mistakes. But before making amends, Kang Maru is intentionally bleak who sports a murderous glare that is empty and cold. With his revenge plan in motion, Song plays Kang Maru’s ambiguous character to perfection. Is he a nice guy or is he not? Of course the answer is that he is the worst kind of nice guy: at Maru’s core he is the nicest guy in the world—able to do anything for the one he loves. But that idea is so crippling and so flawed because Maru gets easily manipulated by his affection for Jae Hee to make bad decisions. Maru is an empty soul looking for a way out of his hell and really his revenge plan is nothing but a way of dealing with his sad life. But he unexpectedly fell in love with Eun Ki and suddenly he’s thrust again into his role as the nicest guy in the world. 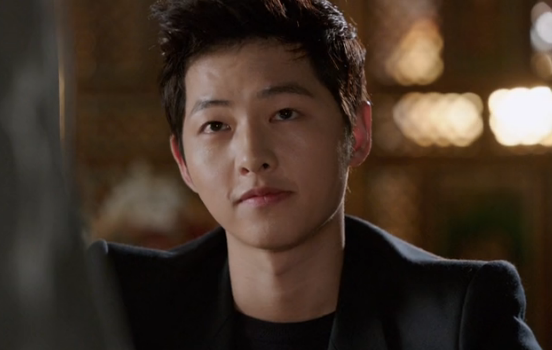 Through all these changes, Song Joong Ki is never less than impressive. His face is expressive enough to suggest that he is nice and mean at the same time. He can go from being calculating and manipulative to being the sweetest guy in the world in a second as demonstrated by that literal eye-opening kiss he gives Eun Ki. But in between his scheming and his love, we see a guy who just wants someone to be as loving to him as he is to them and that is the hardest thing to find for him. Song is so good that whatever flaws the show might have gets shoved aside because of his wonderful and completely nuanced performance. Best Scene: That park bench scene with Jae Hee where he confesses, regrets, and becomes nostalgic in just one powerhouse scene. We finally see the real nice guy come out. Beautiful and heartbreaking. Perhaps this is a shocking ranking considering the tons of praise his performance has gotten all around the web and I am truly awestruck by this performance. Joo Won sheds every sense of vanity and comes out with a devastatingly good turn as Gaksital or Kang To. What aids Joo Won’s performance is the chance to be able to build his character from the ground up: his start as a giant dickhead who is mean to his own family and turned on his own country. But as he becomes Gaksital, we see the resolve, passion, and clearly his own shame at his abandonment of his family and country play out in striking ways throughout the course of the show. Joo Won is so cuddly and cute in person that I had to look away in some scenes because he becomes a completely inhabited person here. There is always so much agony and burden behind his eyes. What’s more powerful is how he connects and interacts with Shunji, his former best friend turned worst enemy. The struggle to do what is right for the country and to protect the ones he love weigh him most especially because he cannot always do those things. By the end of the show, I felt depleted because Joo Won has so nourished this character’s soul with a forceful performance throughout that you just get sucked into it, and like a prisoner, I’m not getting out anytime soon. And for my own sake, I think that’s a good thing. Best scene: His wedding. Kang To is full of smiles and giddy anticipation of wedded bliss with Mok Dan until it suddenly becomes the biggest tragedy of his life. Yes, that’s right. Of all the beautiful performances this year that captivated me, one particular tiny show that became something of a cultural force kept tugging at my heartstrings despite the fancier, more technically marvelous, and downright showier performances this year. The heart wants what the heart wants and mine couldn’t resist but crown Seo In Gook’s Yoon Yoon Jae the best performance this year. For such a newbie actor, Seo In Gook is unquestionably great in this role. Yoon Jae is not a terribly complex character like Gaksital or Maru nor does he go through some sort of enormous growing up like Jae Ha. He isn’t even as funny as Yoo Bang. But he combines all aspects of the four other men on this list and alchemizes a beautifully lived-in, heartbreaking, and relatable character. He adds dimension to Yoon Jae with his little disgruntled looks and he can be really funny with a good sense of comedic timing when called upon. Being a teenager is tough but being in love with your closest friend and not getting noticed is difficult. Seo shows just how much anguish seeps through Joo Won, whether it’s wishing that Shiwon sent her the song or seeing Shi Won walk with his best friend Joon Hee. It is the warmth and feeling he shows that pours out of every pore as he musters enough courage to finally confess his feelings to Shi Won only to be heartbreakingly beat to the punch by his brother. 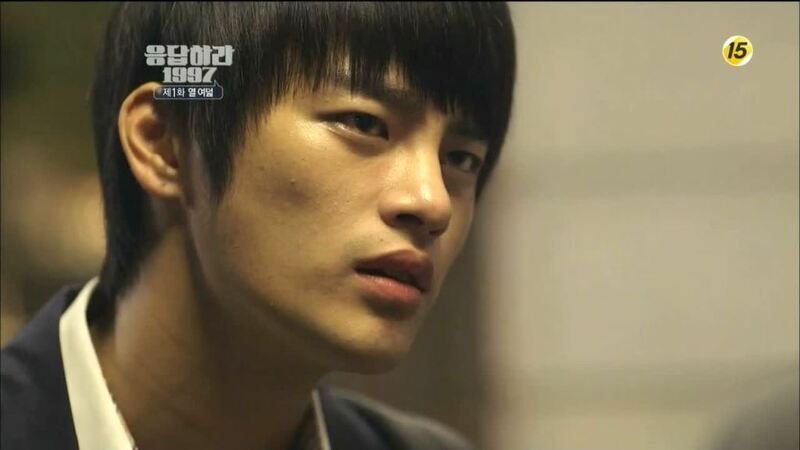 Every connection Yoon Jae makes sparks on screen, whether with Shi Won, his brother Taewoong, Shi Won’s parents, or Joon Hee. Seo is so good at making those relationships sparkle and I wouldn’t doubt they were friends in real life or that he loved Taewoong enough to actually give up on his dream girl or that he loved Joon Hee enough that despite knowing he is gay, he never lets go. Thus, no character ever gave me a sense of joy onscreen this year like Yoon Jae and I can definitely say (today, at least) that Seo In Gook’s performance is my vote for best lead performance this year. Best scene: At the karaoke bar, he confesses his feelings to Shi Won. The build up to that scene over the course of a few episodes was perfectly released by Seo and his goodbye was gut-wrenching. Nothing moved me as much as that this year.